This recipe for Cheesy Grilled Skillet Potatoes with Bacon and Herbs has quickly become a family favorite! 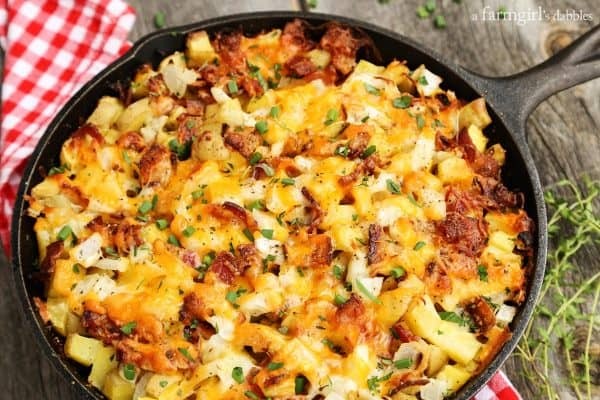 During the last few visits that my family has gathered at my parents’ home in South Dakota, Mom has been experimenting with making the perfect cheese and bacon potatoes. 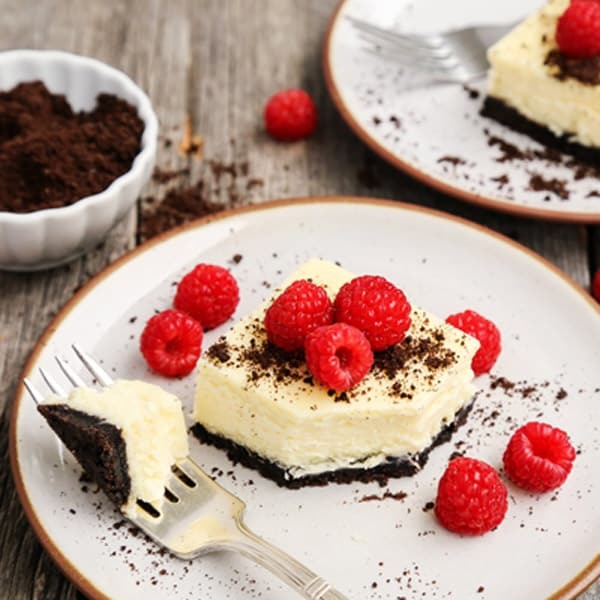 She and Dad had enjoyed one such dish on a motorcycle trip out to Pierre (South Dakota) this spring, and they knew it would be a hit with their own children and grandchildren. 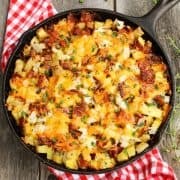 Mom has made these potatoes different ways, with varying amounts of cheese, bacon, and butter, and in different styles of pans, both in the oven and on the grill. 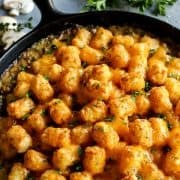 The cheesy potatoes have become a quick favorite whenever we gather around their table and disappear F.A.S.T. Here’s my version, with a little tutelage from Mom. It’s summer, so I naturally gravitate toward cooking everything I possibly can outside on the grill. A cast iron skillet works beautifully, but Mom has also grilled these potatoes in a disposable foil pan. Either way, this is an easy dish from the grill that goes well with so many summer menus. 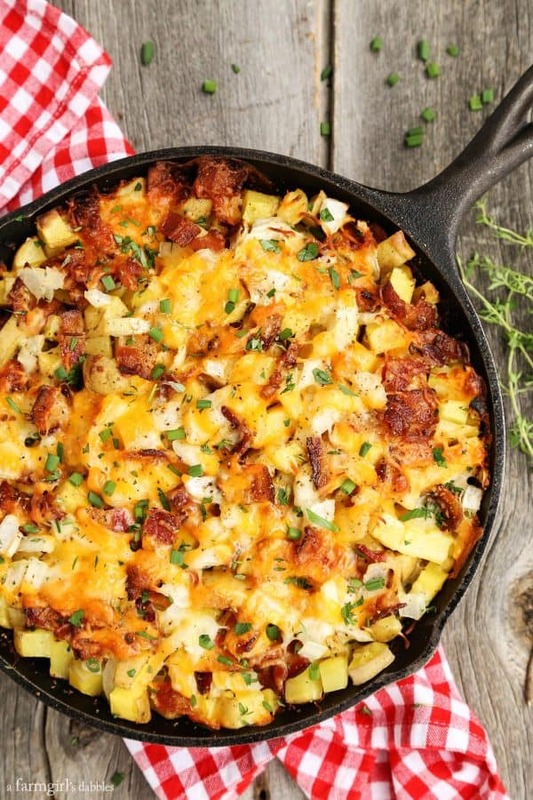 Cheesy Grilled Skillet Potatoes with Bacon and Herbs. 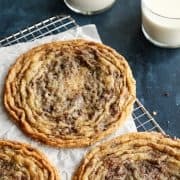 Give this recipe a try! * This post is sponsored by Crystal Farms® Cheese. Living in Minnesota, I can find Crystal Farms Cheese in almost every grocery store I regularly shop at. Lake Mills, Wisconsin, located between Madison and Milwaukee, and in the heart of America’s Dairyland, is home to Crystal Farms. Since 1926 they have been committed to providing the highest quality products to all of us cheese lovers. Crystal Farms products are rich in calcium, and natural with few preservatives. 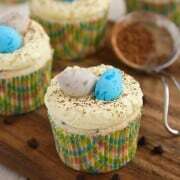 All products are gluten-free and lactose tolerant. For a little more on the history of Crystal Farms, plus some very fun cheese-filled facts, click here. Summer and grilling go hand in hand. And so does the combination of potatoes, cheese, and bacon. It’s a wonderful, wonderful thing. 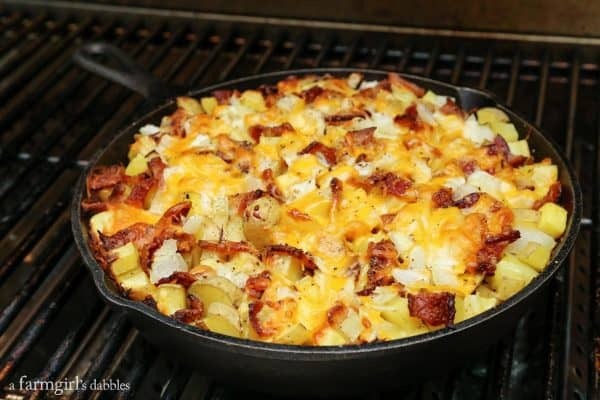 In this cheesy grilled potatoes recipes, potatoes are layered into a cast iron skillet with sweet onions, bacon, plenty of fresh garden herbs, and two different kinds of Crystal Farms shredded cheeses. 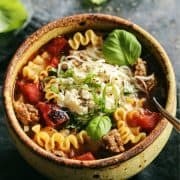 The 6 Cheese Italian blend pairs beautifully with the herbs. And I couldn’t go without some Cheddar, a family favorite. A bit of water helps to steam the potatoes under a foil tent on the grill, while butter adds richness and undeniably great flavor. These cheesy grilled skillet potatoes are a real crowd pleaser, made famous in our family by my mom. I think she’s quickly found out that she needs to make a bigger pan when it comes to feeding our crew. Because there are never any leftovers. And really, that’s the very best sign of an awesome dish. Heat grill to 325° F to 350° F.
Coat inside of 10″ cast iron skillet with 1 tablespoon of the butter. Add half of the potatoes, spreading them out in an even layer. 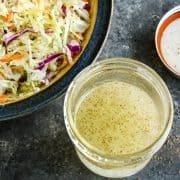 Drizzle the water over potatoes. Dot 3 tablespoons of butter across the potatoes. Sprinkle with salt and pepper, as desired. Add about 2/3 of the onion and then 2/3 of the bacon. Sprinkle on half of the herbs. Then add 1-1/2 cups of the 6 Cheese Italian and 1 cup of the Cheddar. Now add the remaining potatoes and dot with the remaining 3 tablespoons of butter. Sprinkle with salt and pepper. Add the remaining onion, bacon, and herbs. Sprinkle the remaining 6 Cheese Italian over the top, finishing with the remaining Cheddar. Poke a few pieces of the bacon up through the cheese, for a pretty effect, if desired. Cover skillet loosely with foil, taking care to not let the foil touch the top of the potatoes (so the cheese doesn’t stick to the foil). Set skillet on hot grill grates and check the potatoes after they have been on the grill for 30 minutes, adjusting temperature if needed. The pan should be sizzling, but make sure the temperature isn’t too hot that the potatoes are burning. 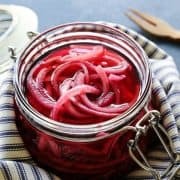 Let cook for about 50 to 60 minutes total, or until potatoes are very tender. Remove foil and let cook for a few minutes more to brown up the cheese, if desired. Remove skillet from heat and let sit for a few minutes before serving. 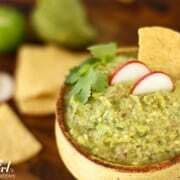 Sprinkle with additional black pepper and chopped herbs, if desired. 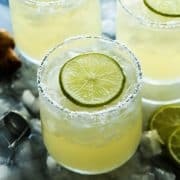 Crystal Farms is offering up a great GIVEAWAY! 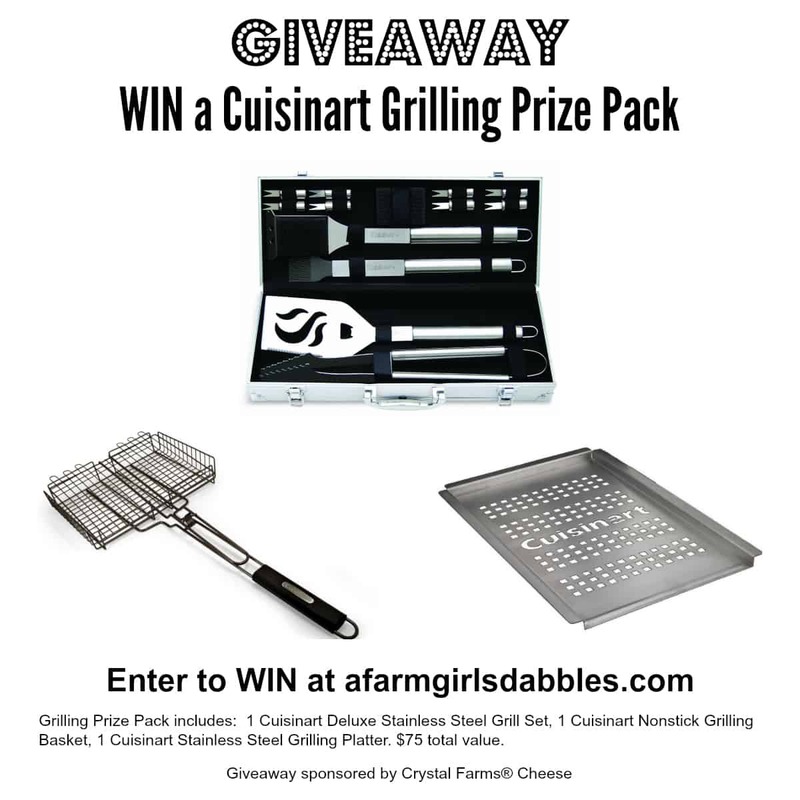 Enter to win a Grilling Prize Pack, including 1 Cuisinart Deluxe Stainless-Steel Grill Set, 1 Cuisinart Nonstick Grilling Basket, and 1 Cuisinart Stainless Steel Grilling Platter. Click here to enter! 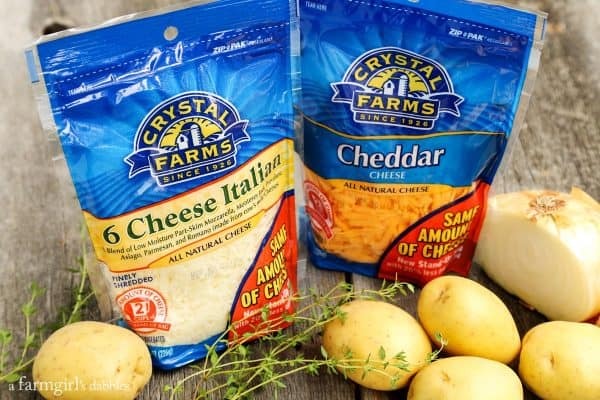 For more Crystal Farms #cheeselove, be sure to check them out on their website. You can also find them on social media on Facebook, Twitter, and Pinterest.